We hope you like our wanderings over time and space and that you've found our site interesting. Before retiring, Tom received a Ph.D in Geophysics from UC Berkeley and was involved in technical matters for over 30 years. He is a ham radio operator and has served in various research, educational, Information Technology, and tax preparation positions for all of that time. Over the years, Tom has tried his hand at poetry about the outdoors. Some of those works can be found under the "Mountain Airs" section of this page. His wife, JoAnn, is a artist (oil, watercolor, and pencil) and has owned and managed art galleries, worked as a doctor's assistant, co-owned and managed a retail kitchen gadgetry shop prior to retirement. She is also a certified Master Bridge player and plays bridge with groups several times each month in addition to painting. 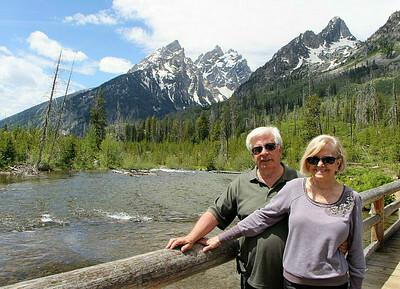 Please come back again to view new trips we might have either here or on our Blog. The home page panorama is of Waterton Lake, Canada. The town toward the right side of the photo is Waterton. And from SmartSound. Unless otherwise specified. Pentax K1 full frame with D FA 24-70mm f2.8ED SDM WR Lens. This is Ricoh's first full-frame camera. A 36.4 MP camera that offers a full-frame sensor with image stabilization.